Bashundhara Group Job Circular 2018. Bashundhara Group will recruit for various Posts on the basis of direct Interview circulated a recruitment advertise of Job circular on See the Job Circular for details of different posts. Interested and eligible Bangladeshi Citizenship candidates are requested to apply after fulfilling the circularized conditions and instructions. Deadline for direct Interview on See the Job Circular for details of different posts. Bashundhara Group is one of the best and vast group in the business sector in Bangladesh. Bashundhara Group is one of the leading and familiar Group. Bashundhara Group has Been published great Job opportunities on their website www.bashundharagroup.com. To know more details please see the attached image Job Circular below. How to Apply: Interested and eligible candidates may apply for the vacant positions after fulfilling the circularized conditions and instructions above. 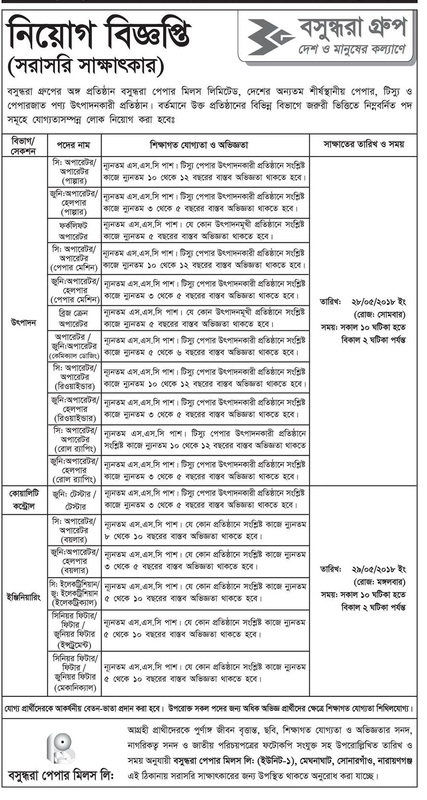 The Deadline for different posts sees the attached image job circular for details.